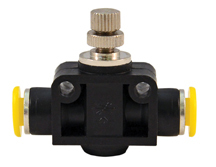 Clippard offers four styles of adjustable flow controls with #10-32 through 3/8” NPT ports. 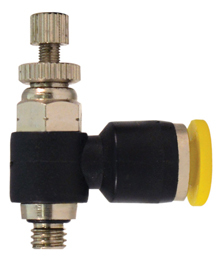 They are an ideal valve for use with a cylinder, providing a slow extend stroke while allowing a fast retract stroke. Flow controls are also used in delay functions when using air piloted valves. These combination needle and check valve flow controls are typically used to control air flow from air cylinders, thereby controlling the speed at which the piston strokes, either while extending or retracting, depending on their location in the circuit. The In-Line Controls can be easily added to existing circuitry and are lightweigt and compact. Since it is a tube-to-tube connection, in-line flow controls may be installed as a meter in or meter out device. These precision-made valves offer independent valves sharing only a common body. 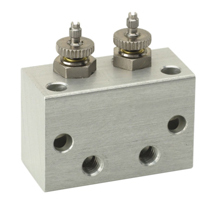 This allows separate pressures and/or gases to be used while simplifying mounting.